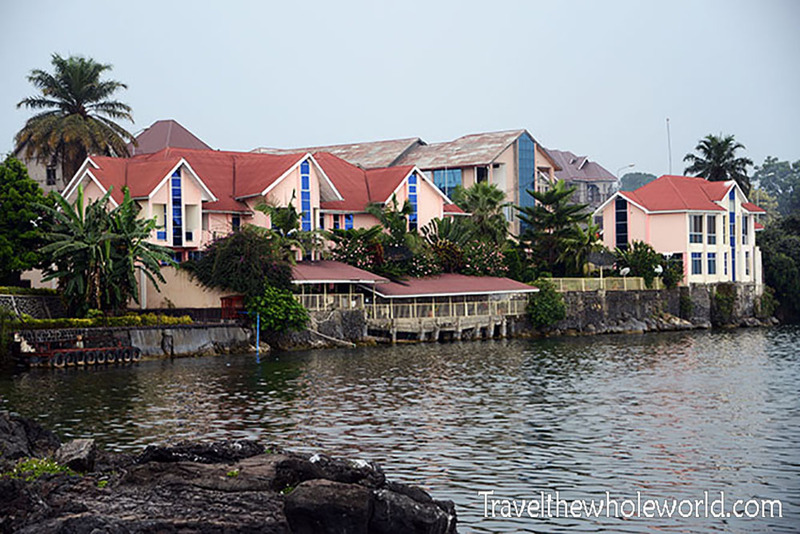 Once upon a time, most of Goma looked like this; a beautiful lakeside town that was even considered a resort by some. 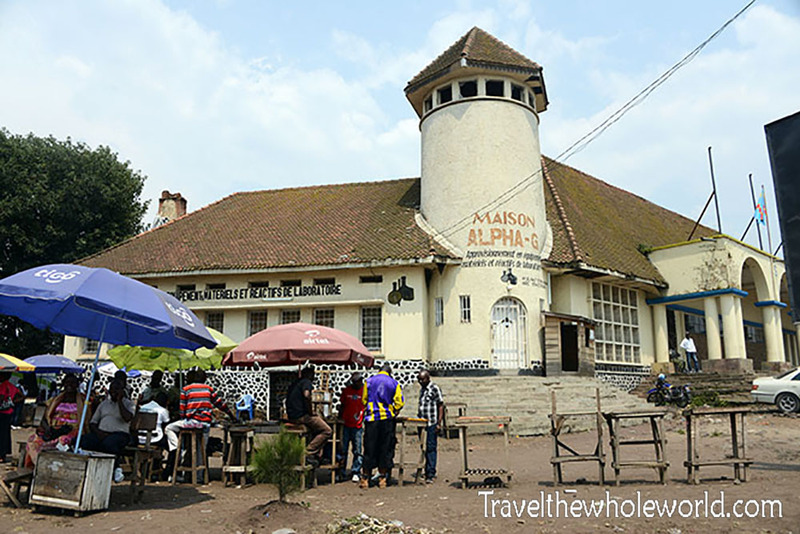 Establishments such as restaurants, hotels and cafes lined the north shores of Lake Kivu, and there was much to do in the area. Sadly the city is more known for hosting foreign troops these days rather than a weekend getaway. 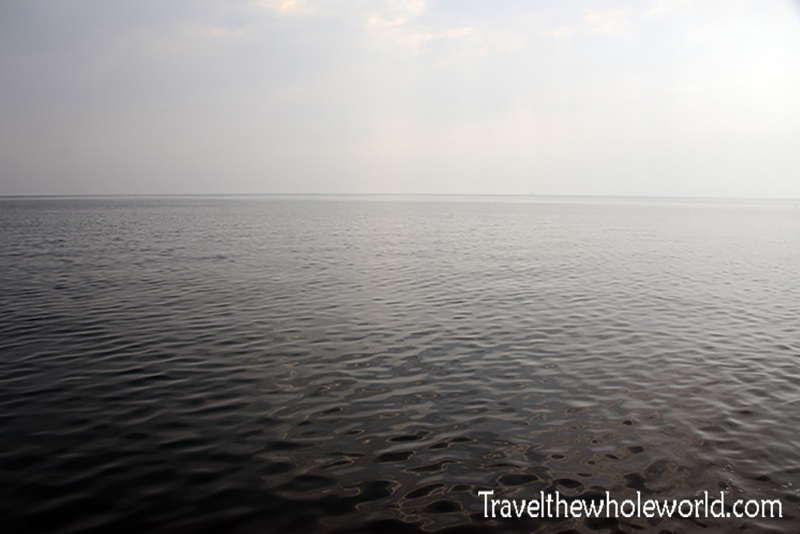 I mostly used Goma as a point of entry to gain access to all the natural wonders that surround it. 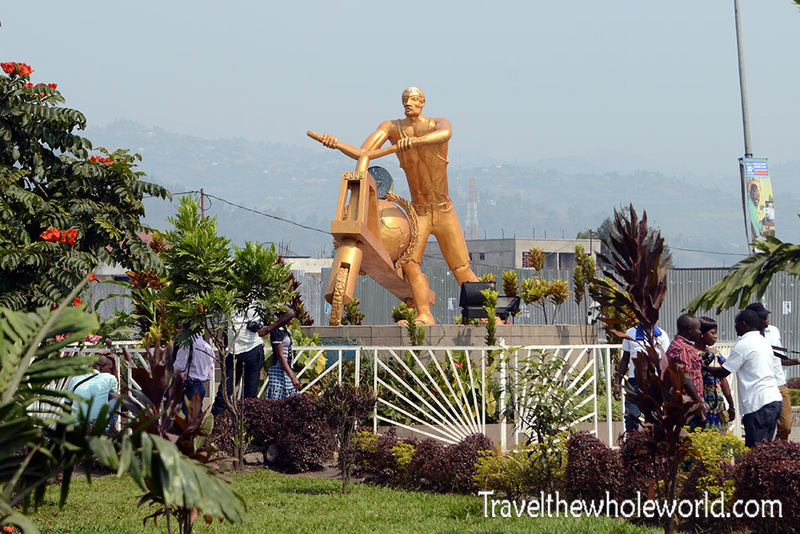 As a travel destination, Goma itself has few things to attract travelers. 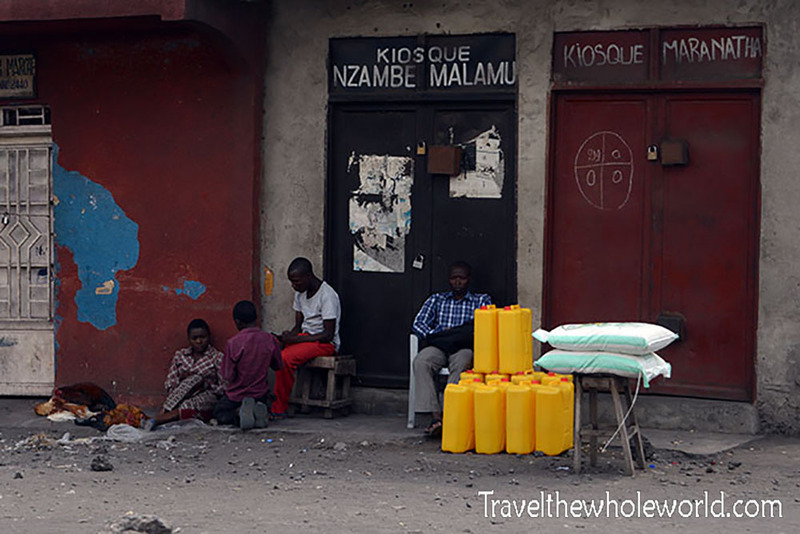 The most interesting aspect of visiting Goma is the culture and way of life here. Things seem to be on a positive run for the moment, but even a few months before I visited the entire city was overrun by M23 rebels. The city itself isn’t famous for any special landmarks or points of interest. 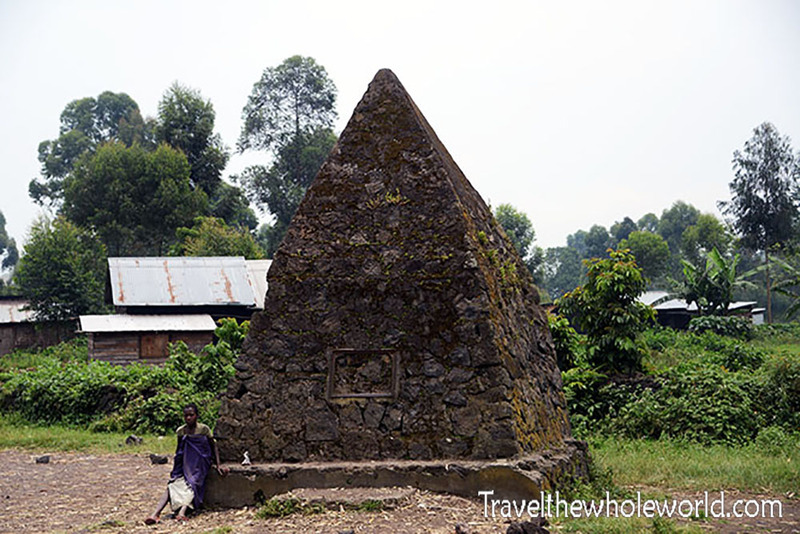 These two memorials in the center of Goma were about the only “sights” I saw. I’m not sure what the memorial above is dedicated to, but the on the one below is clearly for the 2002 volcanic eruption that brought massive destruction to the area. The volcanic eruption essentially destroyed the entire city, and also raised the elevation about 10 feet (3 meters). Some parts of the city you can still see the original levels where some old buildings have been dug out. 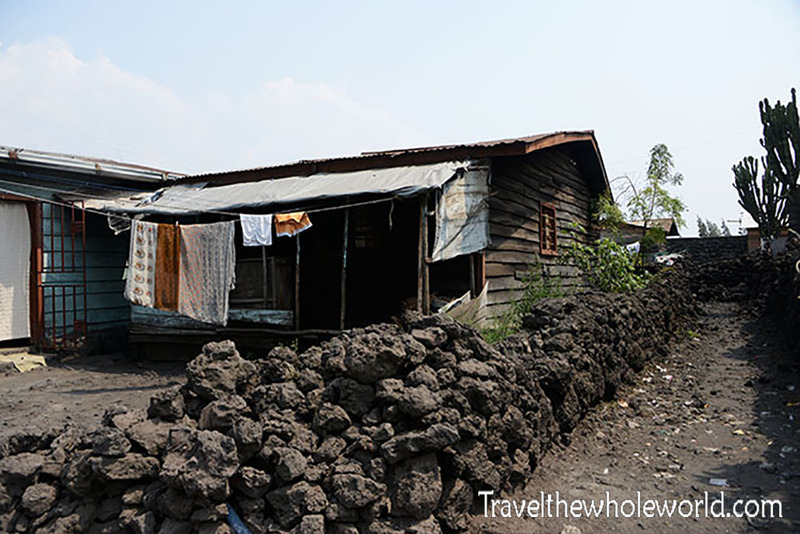 After hearing so many stories about the eruption I nicknamed Goma Lava City to the approval of the locals.. It’s hard to imagine Goma ever being a nice city, but supposedly the lava really sent it back a few decades. Some parts of the city have removed the lava before rebuilding, while others have accepted the situation and used the lava for creative things such as a fence for their yard. 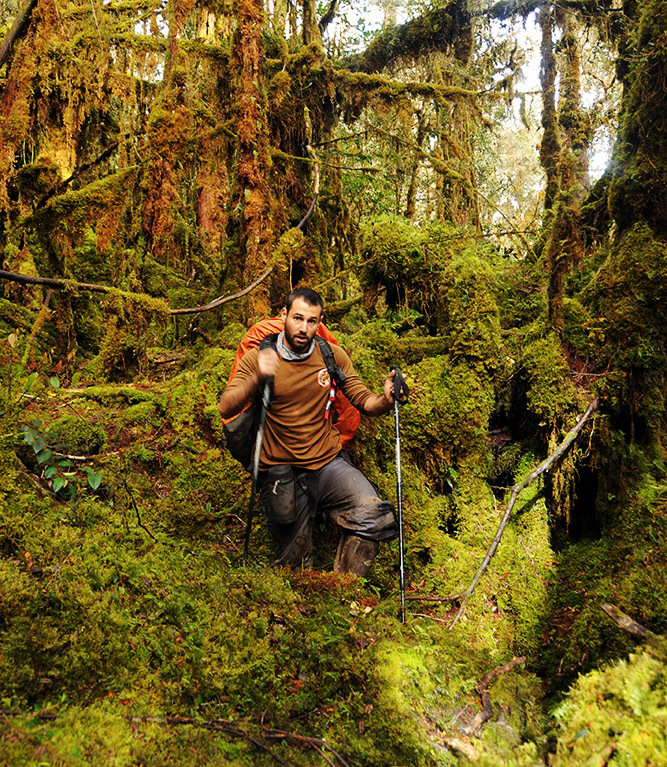 I asked some locals if they minded if I took some lava, and they said please, take it all! Next to seeing lava all over the place, you’ll also notice that the UN has a very large presence here. 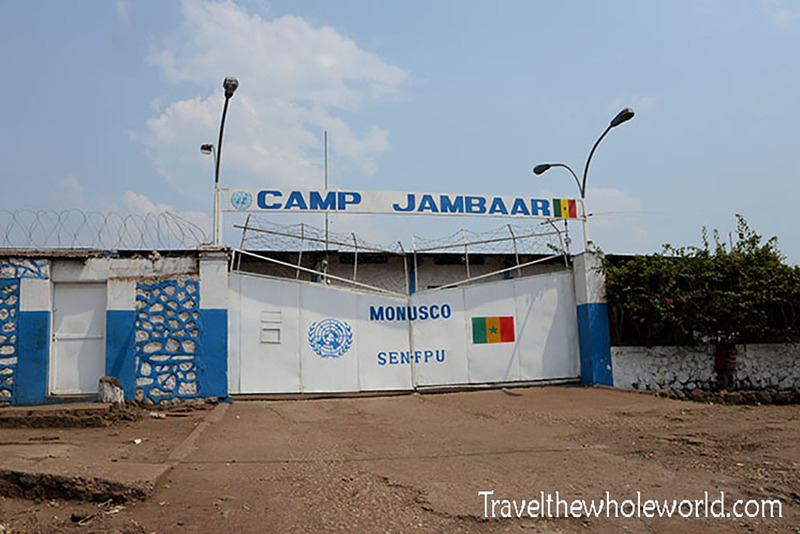 If you travel through the city you’ll constantly come across UN buildings or troops. This photo shows a UN soldier from Uruguay while below you can see a separate base that houses UN soldiers from Senegal. One of the Congolese locals I met while in Goma claimed that the real reason the UN was here was to make sure that Congolese minerals were exported, rather than to bring about stability to the region. Just a week before I arrived, the UN security council had voted in favor of attacking FLDR rebels outside of Goma, which would certainly be an unnecessary task if they were only concerned about minerals! The local I talked to also said that occasionally UN troops from Asia would ask him about gold and other precious stones. Corruption from individuals with any organization is normal, but I met a UN commander here from Sweden and he was clearly passionate about what he was doing and truly trying to make a difference. 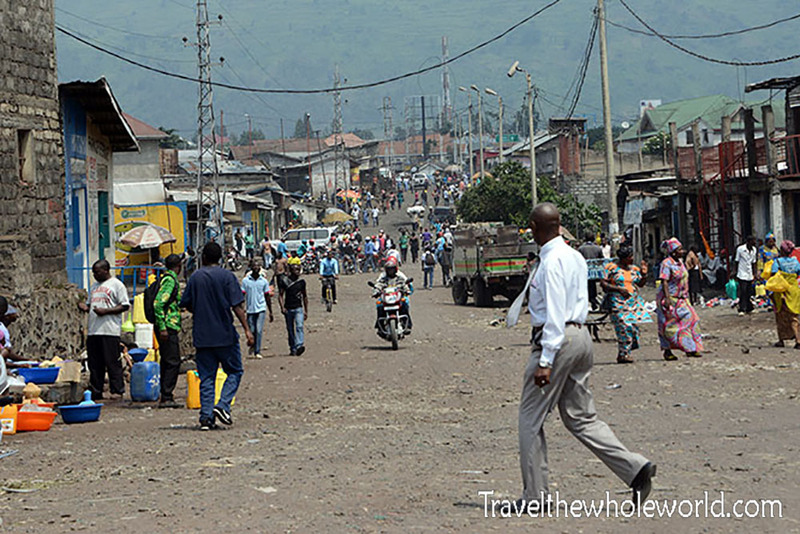 These two surrounding photos show some more common scenes in Goma of patrols. 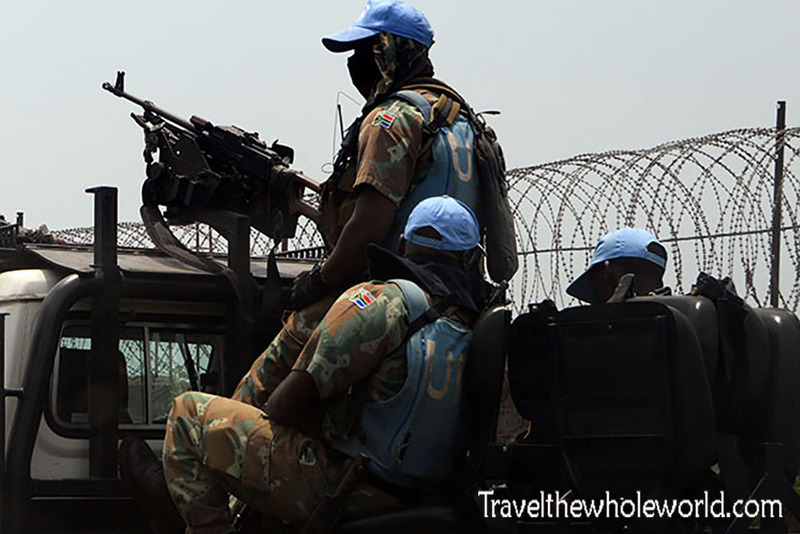 The one above is another one from the UN, while the patrol below is actually Congolese soldiers. The current wars in the Congo have gotten lots of attention, but the region has seen wars for over a century. This memorial above is dedicated for World War I, when the Germans fought British and Belgian troops here. The German loss in this war is what directly led to this region becoming a Belgian colony! 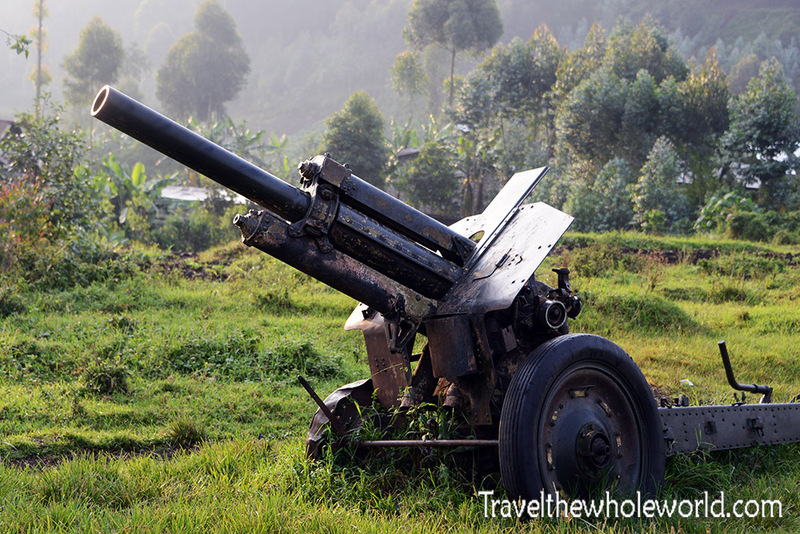 The current Congo war was on going during my visit. 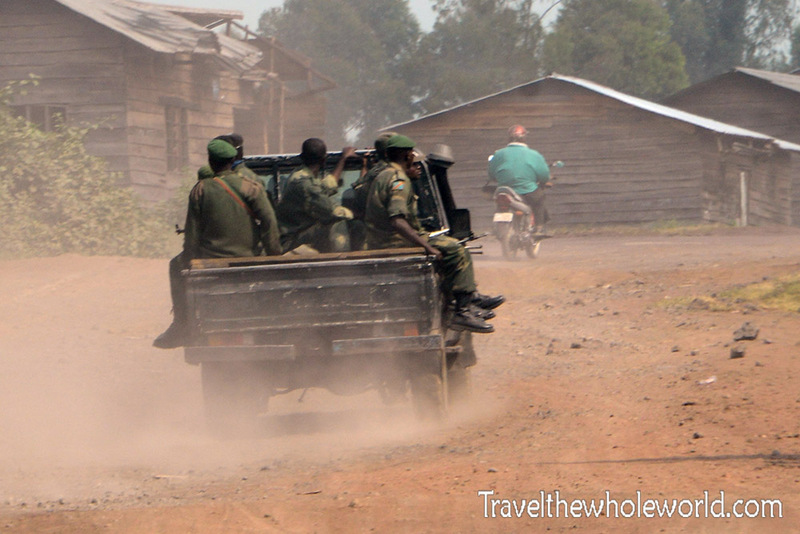 Even though things seemed normal, you can still see Congolese troops on patrol and even artillery still set up around the city. 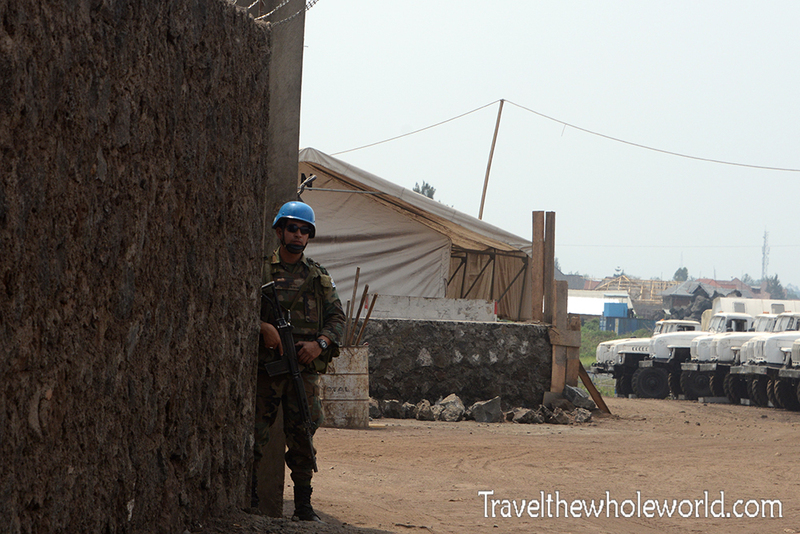 It’s hard to imagine, but only two weeks prior to my visit rebels had completely taken over the city of Goma. 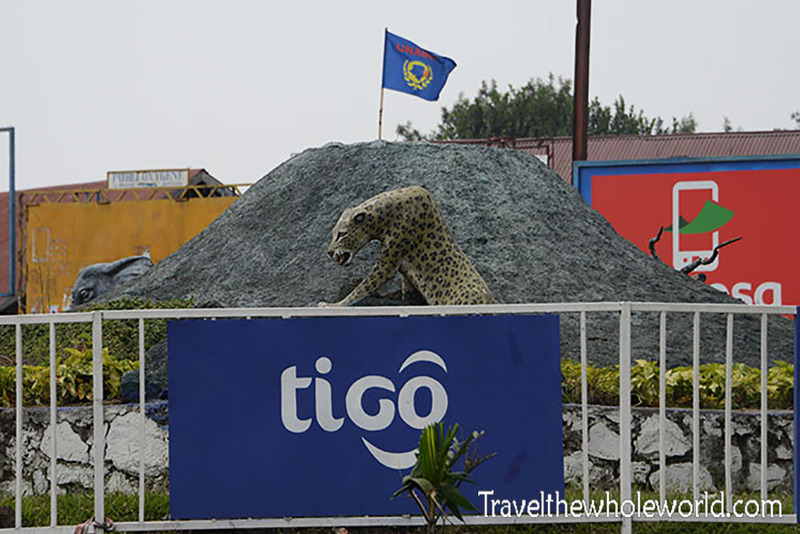 My visit to Goma was the way I prefer it, uneventful, but things can change at any time. 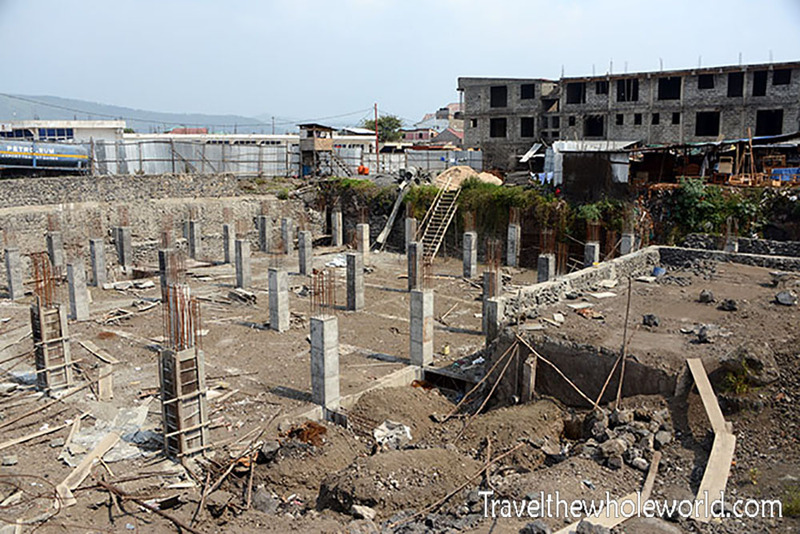 There were at least two large churches I saw in Goma. 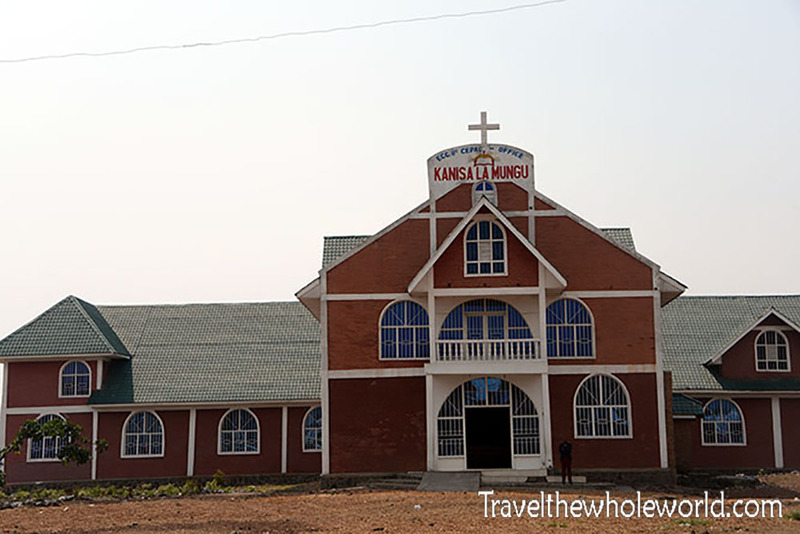 Congo is primarily a Christian country when it comes to the cities, but there are Muslim minorities as well, and those living out in the bush still practice animistic religions. 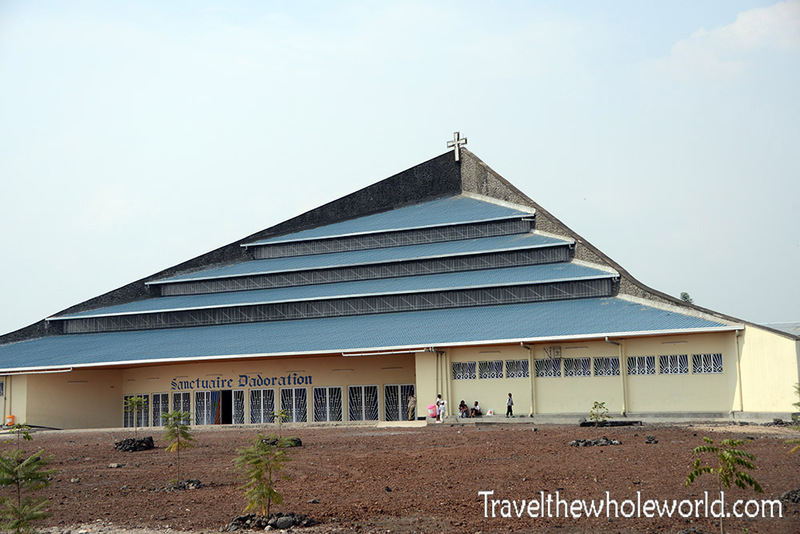 The two churches I came across in Goma are the Cathedral of Dadoration above, and the Kanisa La Mangu Church below; both impressive, especially by Goma standards! I don’t know much about either church, but I know for sure that Dadoration Cathedral was destroyed by the 2002 volcanic eruption and rebuilt. While I didn’t go inside and regret that, from the outside it looks like one of Goma’s nicest structures. I was told this area above was Goma’s “Black Market” by a local. It was a bit hard to believe since it was so open and also located at a major intersection. With that said he was either wrong or it’s just a place where you can by knock off goods and fake products, rather than machine guns and RPG’s. These people below were also located in the black market section and didn’t seem to be up to no good. From my experience people in Central Africa hate having their photo taken. 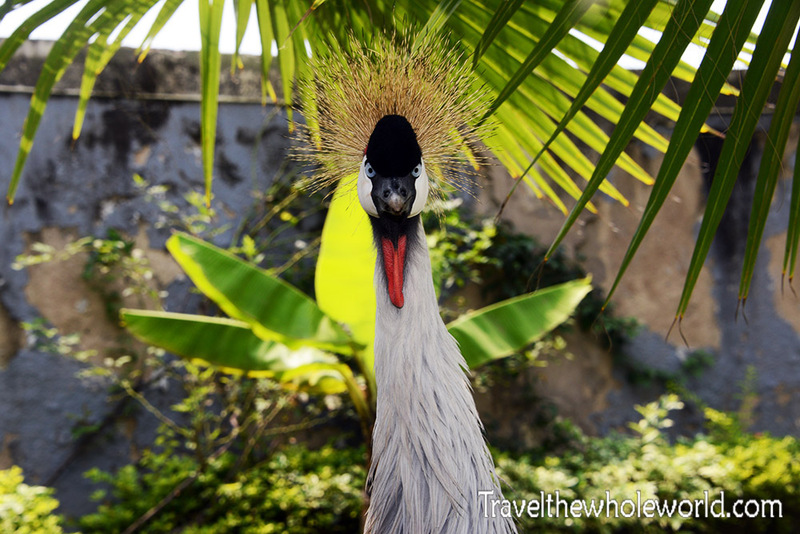 Even this Peacock I found in Goma clearly disliked having its photo taken. Taking random photos is frowned upon and can bring about a little bit of chaos. 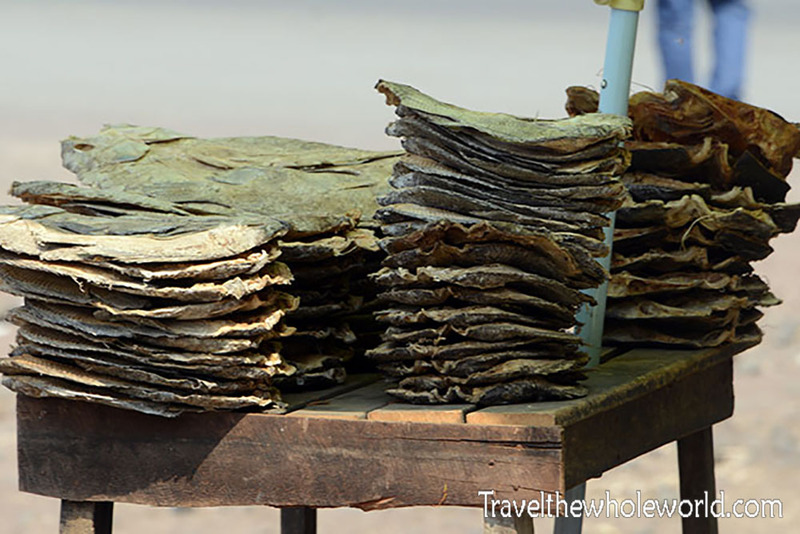 This picture of fish for sale was taken in a market that was closely guarded by a Congolese woman. She defiantly refused to let me photograph it but fortunately for me I have a zoom lens and could take it from a distance! 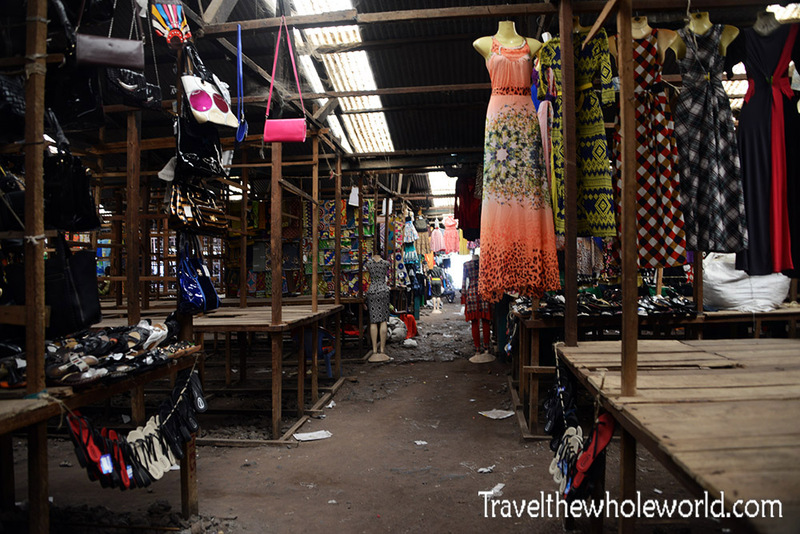 The market in Goma was never exactly crowded, but there were definitely some places that were somewhat lively. It’s obviously hard to take pictures in places when people don’t like it, so the only shot I was able to get was this empty section. This photo below is from an outdoor store that somehow had some decent couches for sale. Of course they’re imported, which probably makes them even more expensive, but still it was strange to see a few places selling high end goods. 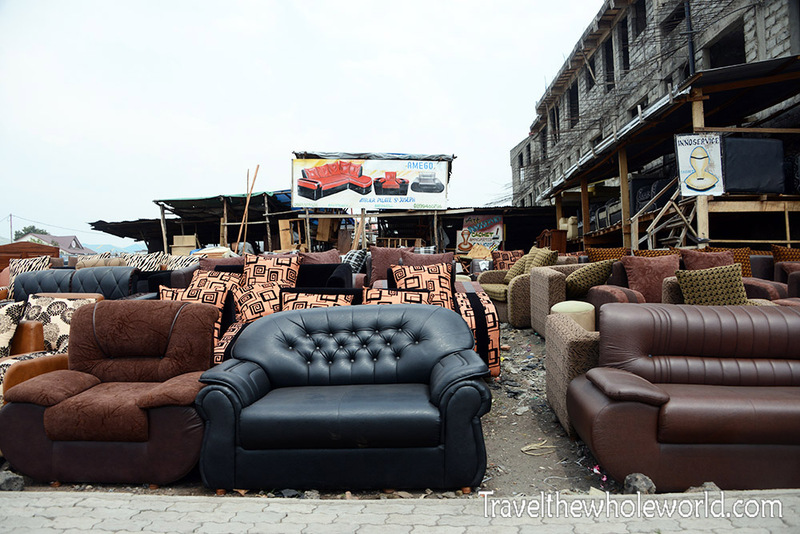 I’d assume most things in the market were imported from Rwanda, but throughout the city you can see things being made in Goma. This smoking stack was created by people who are making their own charcoal to sell in the city center. 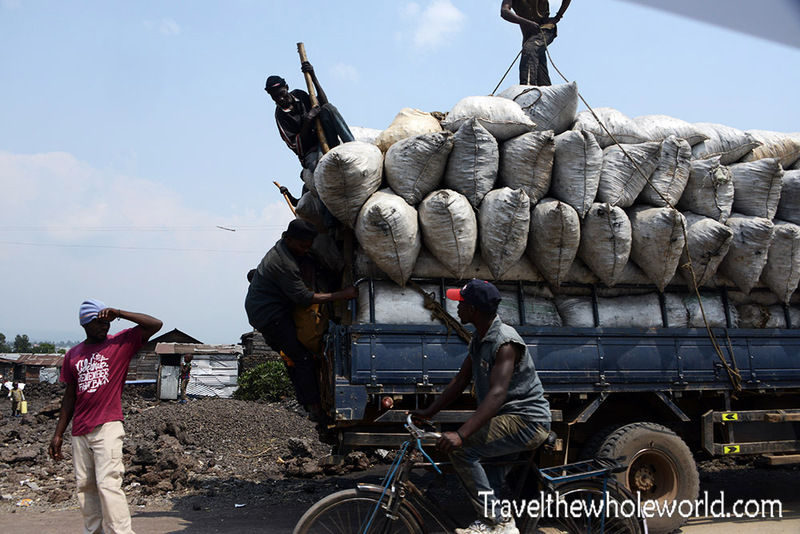 It seems to be a huge commodity here, and I saw lots of trucks and people carrying charcoal around the entire city. Often you’d see women with huge bags of it on their back, and occasionally these big trucks of it seen below. 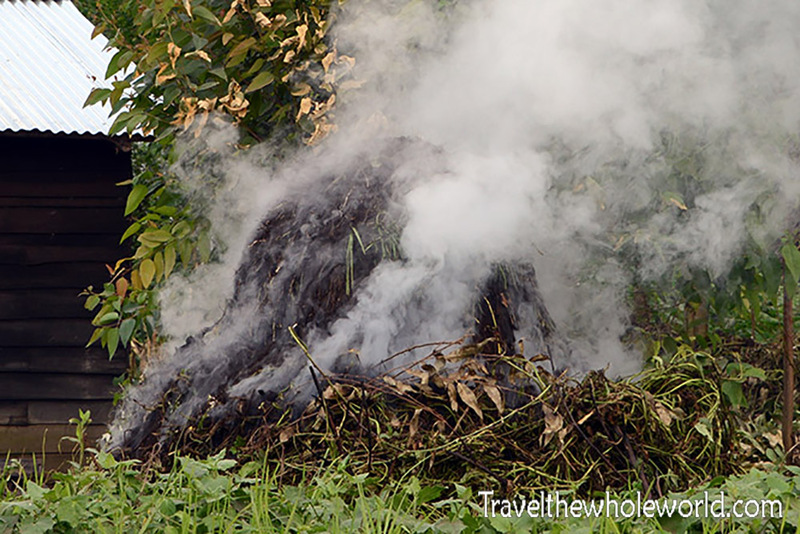 It makes sense that charcoal is such an essential item in a third world country like Goma. Just about every single household will need it for cooking. 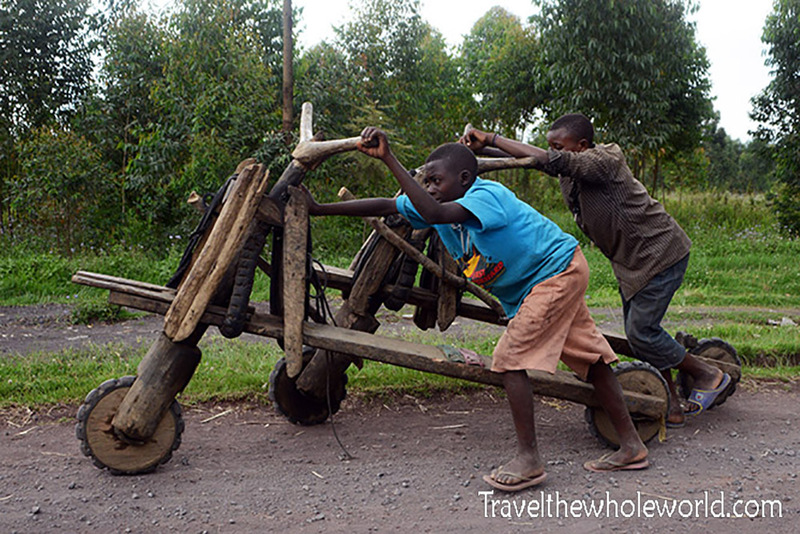 Something that I had never seen before until I came to the Congo was wooden bikes. Yes, frame, wheels and handle bars are all made out of wood! 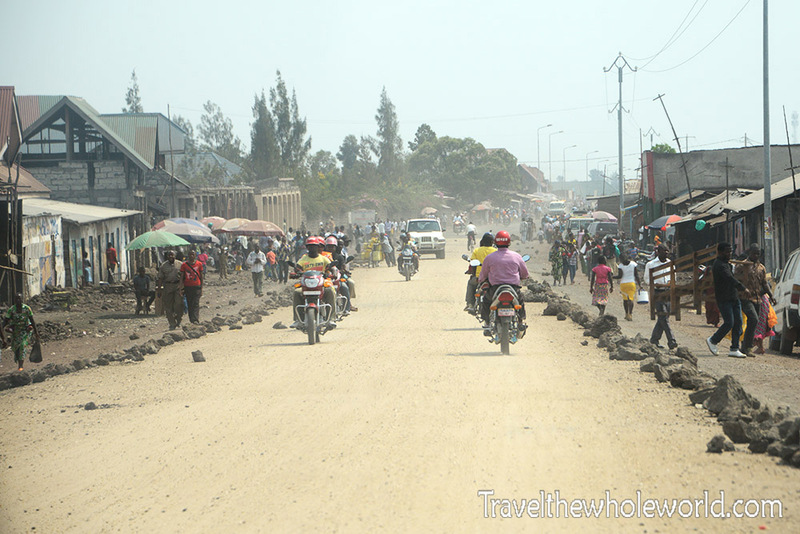 While driving in Goma, a local told me that the bumpy roads were nicknamed a “Congo Massage” from all the shaking your body gets. I imagine that experience is much worse on a wooden bike that has zero shocks. 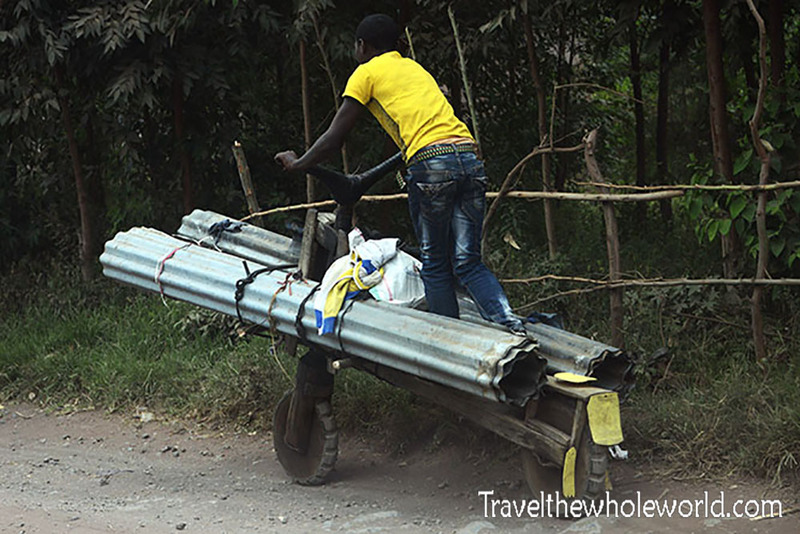 The bikes are more like wagons for transporting heavy goods and are not ridable uphill. I saw lots of young boys and men using wooden bikes while and all the women were carrying heavy loads on their own backs.